An holistic overview of trading in futures market. Read and start trading in bitcoin futures!! 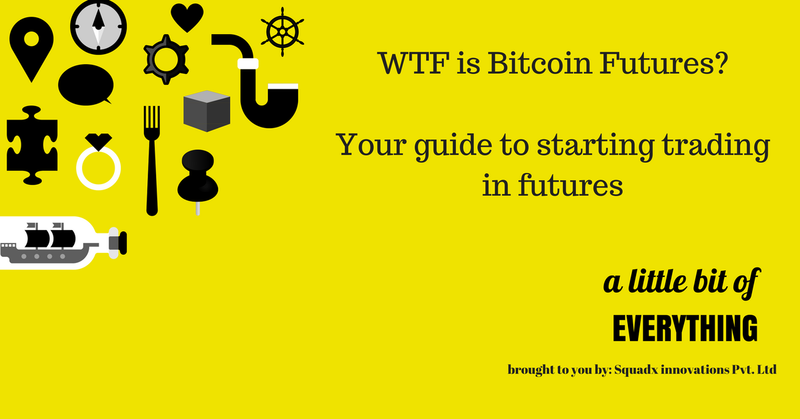 Well there has been a lot of buzz around the introduction of futures and what will be its impact on “future of bitcoin”. If you’re someone puzzled by questions like what is bitcoin futures? How to invest in it? Where to invest?…. Keywords: Technical analysis, market behaviour, tradingview, bitcoin futures. Bitcoin futures is a derivative contract which has a set expiry date and on the expiration the agreed parties execute the terms and conditions as set on the contract. For example you will sell your bitcoin at $ 15,000 after 1 month but the price of bitcoin after 1 month is $ 12,000 you are going to make a quick profit of $ 3000 but on the other side if you would have said that you will buy the BTC at $ 15,000 after a month and the price is $10,000 thus you end up paying $ 5000 extra incurring your loss in your balance sheet. Bitcoin entering the futures with regulatory is a promise that prices will stabilize because of the liquidity provided by the large exchanges and good cash support. This will take bitcoin into a mainstream market for further support of currency. The only difference between previous exchanges and new regulatory driven is the safety net and security even in the case of hack your money is secured. Unlike other bitcoin exchanges to play with futures you need cash and upfront initial margin which acts like a fund provided to buy Bitcoin, you don’t need to put all of the money this gives you leverage to buy more contracts. One does not need to buy Bitcoins to play in futures market , it is just a promise on the note that you are owed a Bitcoin. Another advantage which regulated exchanges provide is less fees, currently if you trade on non-regulated exchanges you end up paying .2% to .5 % whereas you pay $1 for a futures trade. There are different kinds of contract available in the market like quanto and xbt futures where the contract is priced in Bitcoin , its a matter of understanding which contract you want to trade is entirely up to you. All right, getting bored. Let’s answer the big question??? How to invest in Futures? Currently there are many exchanges which offers various kinds of futures contracts where on can book on initial margin. Okcoin promises the highest level bank type security , Hong Kong based exchanges which allows 10x margin on Bitcoin futures. CME is one of the largest exchanges in the world where one can exchange at minimum of 5 BTC with minimum fluctuation of $ 5 per contract and they have specific trading hours. CBOE offers support for weekly , monthly and quarterly contracts with size of 1 BTC with a fee of $ .25 per trade. CBOE support 44 % of margin of the contract. Bitmex is founded by an ex Citi Bank trader Arthur Hayes , where one can take positions with 100x and offers only BTC deposit. This is the only exchanges which has never been hacked. So, Why don’t we try it out. Here’s a one of many strategies you can use to get started. Trading with fixed margin and cross margin? Fixed margin is fixed percent used against the positions once the fixed margin is used you don’t need to worry about balance. It will use only that much once your position is liquidated. Cross margin can be very risk at time , it is like putting everything at once if market moves against your position you are bound to lose everything. Bitmex offers 100x but rather going all you can start small like booking $ 1000 contract on futures as you can see in the picture that i have used isolated margin which is 2x. This allows me to use my funds properly. On the other side as you can see if i would use cross margin then my all of my money is at stake. In case of CME and CBOE you have to get in touch with vendors or stock brokers who has access to Bloomberg feed. CME and CBOE requires 44 % of margin in cash to be deposited first if you want to trade in futures let say the price of BTC is $14000 now and then you have to use $ 6000 worth cash to trade and after that you have to pay or get as per your strategy. In future trading Longs are paying shorts and Shorts paying Longs that is how the system creates profit and loss, but in the event when market moves so quickly that your margins are called then the trading system takes the order because it did not get the liquidation order fulfilled. So at the time of settlement the unfulfilled liquidation losses will be deducted from the profits of all the trader before it is distributed. This is known as socialised losses. CME use their own method which is known as OTC clearing , hence CME acts as buyer for every seller and seller to buyer which ensure financial and security risk. CME system is centralised system where they take care of all the losses and risk involved. Lastly a piece of advice! Invest in derivatives by researching and understanding definitions and important keywords call your friends who know the basics of financial world they can help you to mitigate some of the unknown quantities. You can start by watching charts there are tools available online such as tradingview where you can plot lines and different trends based on the movement of the market. By watching the market you will get to know the direction of the market, stop losses, your target areas. Above chart drawn by an analyst shows estimates that how market may move. There is no such thing as prediction it’s all patterns at most you can get to know your target you are good to go. This is just a small hands on guide to invest in future market if you want to trade on website such as Bitmex you should first try the testnet where you can test the market and once you are ready you can go on the live site. CME and CBOE has started the trading but you can only trade via broker so there is going to be broker who can help you out but eventually you have to select the strategy and take call whether to buy or sell. Do you own research before you put money.